Phytonutrients have been found to play an important role in ensuring hormonal balance in the female body. Such phytonutrients are usually found in formulas for menopause balance and support, such as Arbonne Women’s Balance Menopause Supplement. With the help of herbal extracts, women can reduce the intensity and frequency of hot flushes and night sweats. Other symptoms like mood swings and hormonal imbalance can also be addressed. Here is what you can learn about Arbonne Women’s Balance Menopause Supplement. What Does Arbonne Women’s Balance Contain? With plenty of herbal remedies included, it looks like Arbonne Women’s Balance Menopause Supplement is quite a reliable product. Many of the above ingredients also play a role in maintaining good health in aging women. However, you may want to shop around a bit more, if you want to get the best deal for your money. The product must be taken as follows: two tablets daily with a glass of water, during one of your meals. 60 capsules cost 39USD and they count as a full month supply. For 45 days from your purchase, you can return the product for a full refund, if you are unsatisfied with its results. 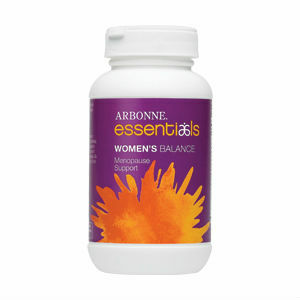 Arbonne Women’s Balance Menopause Supplement contains many important herbal remedies for treating women experiencing menopause side effects. The combination of traditional treatments is very useful, but there may be other similar products on the market you may want to take a look at, before deciding to buy this one, in particular. Jackie Horowitz	reviewed Arbonne Women's Balance	on November 25th	 and gave it a rating of 2.